Steve died this morning at 4:04, peacefully at home with family. At City Center beginning at 6:00 this morning, we rang the densho (bell) 108 times, followed by a service. Similar services were held at Green Gulch and Tassajara, and we are all sitting with his memory today. Family and sangha members are preparing the body and dressing him in an okesa that had been sewed for him over the last several months. All are invited to come and sit with the body at his home beginning at noon today until late afternoon Thursday, including through the night hours. No appointment is needed. The address is 335 Alden Ave., Rohnert Park, CA 94928. Enter through the garden gate at the front. The following is an account of the last hours of Steve's life by his son, James Asher. There will undoubtedly be a formal announcement but I wanted to share with you that your friend and teacher and brother and my father Myogen Steve Stücky has passed on early this morning. He was in some pain throughout the night but had beautiful periods of calm and translucence. As I left him about 3 hours before he finally let go he had the most beautiful smile on his face. His pain had stopped and he seemed to be communicating something - a "yes" is what it felt like to me. His smile was truly peaceful and it looked to me almost a secret smile as if he had confirmed something he had long suspected and it filled him with happiness and love and peace. I know all of you cared for him so much. Know that he is most certainly in peace and in your hearts. With love and admiration and appreciation for all your support and love." The sun of wisdom shines without ceasing. Like a draft of cooling water. With full awareness we have chanted the En Mei Juku Kannon Gyo. Who is passing from this world to the next. He is taking a great leap. The light of this world has faded for him. He has entered solitude with his karmic forces. He has gone into a vast Silence. Posted in Uncategorized on December 31, 2013 by Jay Pennington. Steve was one of the good ones, a really good guy and an excellent teacher. I knew him for quite a long time, and we had some good times with each other over the years. I'll miss him. Goodbye, Steve, and thanks always for your memorable, encouraging smile. Such sad news today, as was Myogen Steve's announcement of his diagnosis three months ago. We have been chanting for Steve here in Chicago, and will include a memorial dedication at our New Year's morning sitting tomorrow morning, and perform a Memorial Service next Monday evening. We recall fondly Steve's visit here and talks a few years ago. Steve's example in facing his death and life these past three months has been a great encouragement. With Love to Lane, and to all our SFZC family at this time of loss. Thank you for Kanzeon! Your lecture years ago was an inspiration. My most profound bow to you and all you represented in the Zen community. Abbot Steve you where my teacher and my mentor for seven going on eight years. You stood by me when I had no one and was alone had no direction and didn't want to live. By both example and your words you taught me stength, indorence, to find the true beauty within myself and that in the stillness of all there was healing, peace, joy and happiness as we settle into the oneness of the pain it becomes part of us but not who we are. The biggest blessing to me I was telling Josho at the Zen center her in North Carolina is what a true example you are to all of us that we your students where so blest by your teacherings that have changed both our hearts and our lives, showing us not just the ture beauty within ourselves but in others and everything around us. I stand in the beauty and stillness of your as you desend you will always walk in the hearts of all of us who will carry out your teachings in the present moment of each day. You bless our lives with the gift of new found beginings. Util are paths meet again. You are not leaving us because your teachings will always continue to enrich our lives and our hearts. Thank you for your living example of presence and love. 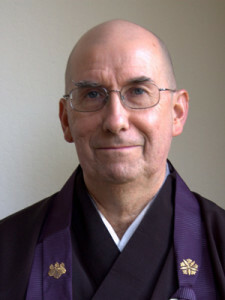 Myogen was a terrific teacher in our SPOT program for developing Zen priests and a fine human being who was honestly interested in hearing and exploring even the most difficult situations. He was a terrific role model who exemplified strength and sweetness together without compromising a shred of his authenticity. He loved teaching in SPOT, and all my students, now here for a New Year’s sesshin, today shared their remembrances of his contribution to SPOT and to Zen in the Central Valley. Blessings for his safe travels were offered, and 108 bells rang out here this beautiful, shining morning in the Sierras. I am particularly grateful to him for our poignant conversations after his diagnosis, and my participation at his side in Christine Palmer’s most exquisite recent Dharma Transmission (on Dec 4th). I will never forget how he remained himself—deeply composed and tender—through it all. Thank you for giving me the privilege of witnessing Steve's process over these months. I have learned and benefited greatly. I hope my passing can also be of benefit when my time comes. Deepest condolences and gratitude to his family. I'm sad, but I'm also relieved. Now he is in a peaceful place. One of the hardest things the past couple of months has been to hear how excruciating the pain was for him. In the blog post his son James said he was peaceful at the end, had a knowing smile on his face. So with the sadness there is gratitude, that the pain and the fight is over, gratitude that he found peace and acceptance in the end. He was an amazing teacher who had a profound impact on my life. A part of me feels like there is this incompleteness between us, that I'm not ready to go on without his guidance. But then I look back on one of the main teachings he gave me, the teaching of responsibility. In a shosan ceremony I asked him "what's all this about?" And his response was "it's about growing up." Those words have stuck with me ever since. The koan of "what is it to be a mature adult in the world?" So in a way, I see it as he was getting me ready for this day. Too soon? Yes. But it's always too soon, there is never enough time. But may that be the motivating factor to make the most of the little time we have left on this amazing planet. Our thoughts of love for Steve's family and thanks for sharing this time of his passage. It was been a hard journey but there is a feeling of gratitude and hope that other loved ones will take this journey with the same calm grace that Steve showed us. I loved Steve Stucky. I will remember the gratitude I felt for him after he played a hand in saving Tassajara. Profound, sweet, gratitude. I don't know if I've ever felt so grateful before. And I will remember how he embodied so beautifully the Way and Steve all at once. Easeful, kind, brave transmission. I love you Steve and I'll miss your blues singing. Farewell dear friend A life well lived. Inspiring us all. my loving thoughts for Abbot Steve's family. deep gratitude to Steve for keeping us close these past few months and teaching us , so simply, how to live. That you waken the furies of the pallid and the cold. From sun to sun dream your singing mouth. I don't want my heritage of joy to die. Don't call up my person. I am absent.